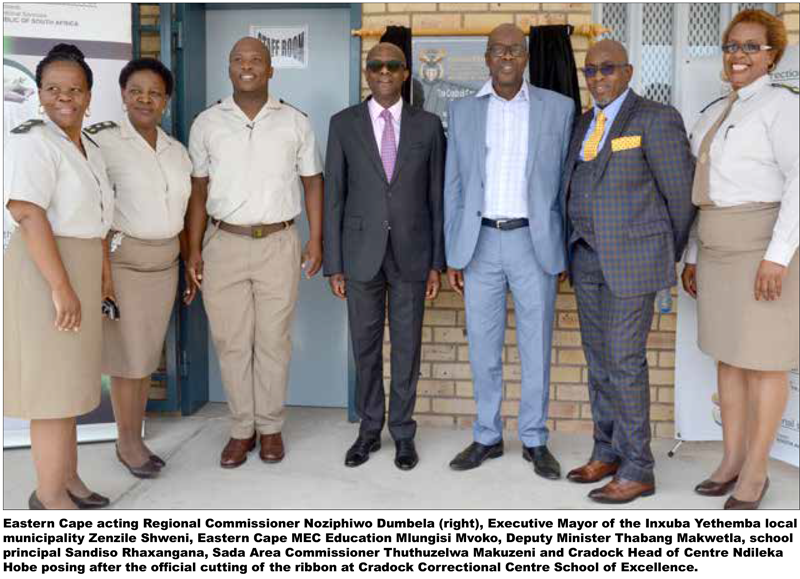 Deputy Minister Thabang Makwetla officially opened the newly constructed Cradock Correctional Centre School on 22 February 2019, bringing the department’s accredited schools to 14. The full time school offers Adult Basic Education and Training (ABET) levels 1 to 4 and Further Education and Training (FET) grades 10 to 12. 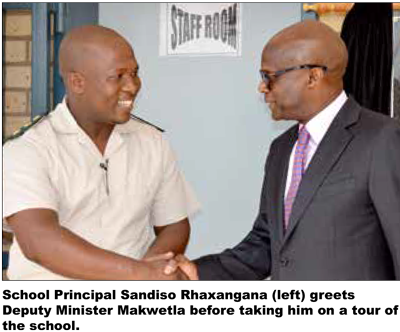 Deputy Minister Makwetla told the youth offenders to appreciate what they have and stressed that a culture of accountability should be instilled in them and that they should learn to take good care of their school. He congratulated the leadership of the department in the Eastern Cape for conceiving the project and managing it until its successful conclusion. Acting Regional Commissioner Noziphiwo Dumbela encouraged the officials to continue their work of rehabilitating the young offenders through education with passion. The school was established in 1999 but had no formal infrastructure, and provisional buildings were used. “There wasn’t sufficient space to accommodate all the learners and staff,” said Sandiso Rhaxangana, the principal. Construction of the new school commenced in 2016 and the learners moved to the new premises in March 2018. It has seven classes for ABET and FET, a library, a computer lab, a staff room and a principal’s office. In 2011, the FET classes were introduced with 19 grade 10 learners who became the first grade 12 class in 2013. The school has achieved a 100% pass rate since 2016. This year it has 24 FET grade 12 students who are adamant to continue raising the bar. The FET band of the education system is a broad category that includes both the traditional academic qualification of the National Senior Certificate (NSC), which is awarded upon the successful completion of Matric, and the vocational and technical qualifications awarded by Technical and Vocational Education Training colleges . Sada Area Commissioner Thuthuzelwa Makuzeni said the Cradock Correctional Centre was converted into a juvenile centre with the intention of centralising the juveniles in the region for educational purposes. 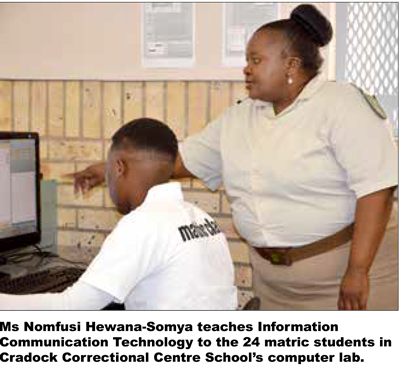 She said it was not an easy task to get the young offenders who came from different centres around the Eastern Cape region to settle down but she was impressed with the increasing number of students. Cradock is one of 15 correctional centres in Sada Management Area. It houses 404 sentenced offenders and 65 remand detainees between the ages of 14 and 25. Head of Centre Ndileka Hobe said they have to continuously keep the juveniles busy with sports and other activities to stimulate their active minds. “We organise sport leagues with the local schools and take them on tours through the South African National Parks in partnership with the President’s Award an inclusive youth development programme,” she said. She further mentioned that this is done without compromising security standards and security classification process for offenders is carefully followed.